There was another mass shooting. The shooter used a shotgun, not an AR15. Joe Biden said the following in 2013: “You don’t need 30 rounds to protect yourself. Buy a shotgun.” Should former Vice President be held responsible for suggesting the use of a shotgun? Of course not. Cox wasn’t the only media person to accuse Trump publicly of “having blood on his hands” because of his attacks on media outlets that disseminate “fake news.” It’s OK for Leftists to attack “conservative” media outlets like Fox News, Rush Limbaugh, and Sean Hannity, but don’t ever question the integrity of the massive Left-wing media giants. Left-wing journalists have been attacking conservatives for decades. We don’t kill them for their bad journalism. We counter them with our own news and opinion reporting that many of the tech giants block on their news feeds. Having the right to “freedom of the press” does not mean freedom from being criticized. “Left-wing billionaire Tom Steyer said perhaps there could be a ‘nuclear war’ that would provide a ‘real course correction’ to Donald Trump’s presidency during an interview published by Rolling Stone.” (Free Beacon) Ponder that scenario for a while. Even after losing his appeal in 2015, the shooter continued to harass the Gazette well into 206. All of this took place before Donald Trump became President. Here’s the important part. 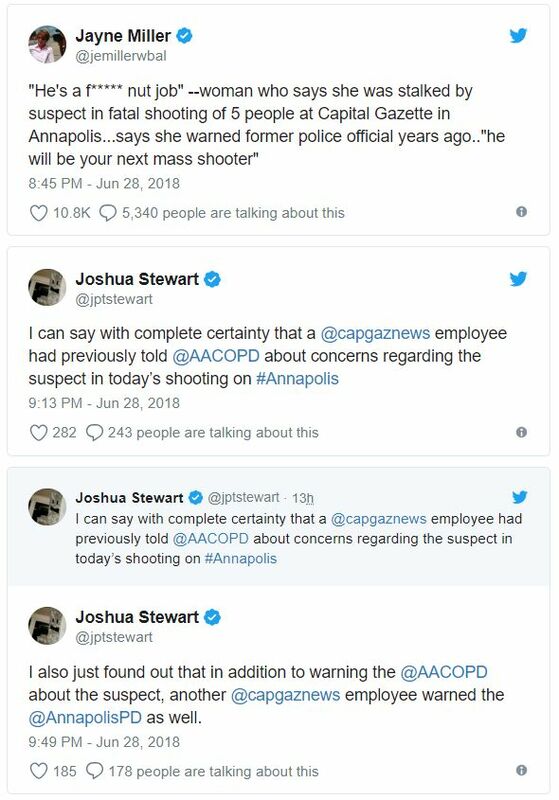 The Capital Gazette knew the shooter was a physical threat. Any paper worth its journalistic salt would have known about the threat of this “f***** nut job” and taken precautions. Some years ago, one of my companies received an envelope filled with a white powder. We called the police. It was a big deal. We often got threats because of the types of positions we took on political subjects. We had been put on the Southern Poverty Law Center (SPLC) “hate list.” We were made a target like the Family Research Council had been made a target when an armed man used the list as a reference guide and tried to kill employees of the organization. “He told the FBI that he wanted to kill anti-gay targets and went to the law center’s website for ideas.” (The Blaze) What stopped him? An armed guard. We started locking our doors. There were always at least two people armed at all times. These are simple and inexpensive solutions. If the media perceive a threat, it is their responsibility to act on it.